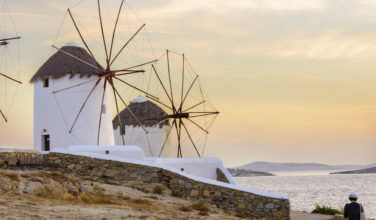 Today, we’re going to be talking about Parikia, the capital of the Greek island of Paros, which is one of the most frequented tourist destinations on the entire island. 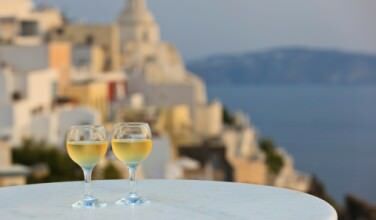 The best part about Parikia is that it’s not just one particular aspect that makes it a popular travel spot. One of the many reasons that people choose to visit Parikia is for the excellent restaurants that line the coast. Take your pick and you won’t be disappointed! You’ll enjoy the food almost as much as you’ll enjoy the view of the breathtaking coastline. Parikia is also known for its amazing nightlife. You haven’t experienced nightlife in Parikia until you’ve planned a night out at Entropy Bar. This is definitely the place to go if you’re looking for a wild party environment. They know how to have a great night at Entropy Bar! The owners are known for being both great and accommodating, providing a wide range of music, excellent drinks and fantastic service. But you’ll have some options when it comes to nightlife in Parikia. A personal favorite of mine is Pirate Bar Paros. This bar does an excellent job of creating a pirate theme in a relatively small space. Pirate Bar Paros gives you that neighborhood, hole in the wall kind of bar feel, which is always nice. Their cocktail menu is top notch, and you’ll often be able to hear live music played there. One last suggestion is to check out Booze ‘n’ Tales Bar. What it lacks in size, it makes up for in personality. The owner of the bar is very personable, loves to entertain his guests and provides quite a cozy atmosphere both inside and in the outside seating area. Booze ‘n’ Tales Bar patrons are always raving about how great the music is at this bar, yet it’s not too loud to where you won’t be able to enjoy a nice conversation. You’ll immediately fall in love with the idea of relaxing with a great drink, while you listen to the waves crash on the beach in the background. While Parikia might be known for their nightlife and coastline restaurants, perhaps the most notable sight to see is the Panayia Ekatondapiliani Cathedral. The name Panayia Ekatondapiliani Cathedral means the church with “a hundred doors”. This wonderfully preserved 4th century church really is a trip back in time, as it is now a museum that you can venture throughout. It is well worth your time to make a visit. Of course, being the main port of Paros island, you have to figure that Parikia has to have great beaches, right? That assumption would be correct, as Martselo Beach is absolutely gorgeous. Some areas along the coast are a little rocky, but most of the areas are perfect for swimming and snorkeling in the crystal clear water. This beach is also really well organized, and has plenty of areas for visitors to sit and relax under a canopy or a beach umbrella. Your other beach option is Krios Beach, which is a nice, quiet beach with golden sands. 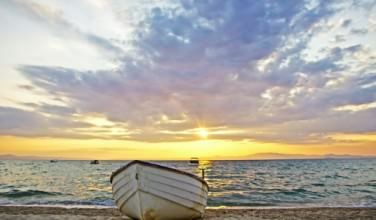 It’s in walking distance of plenty of restaurants, and is known for being a really clean and peaceful beach that is easy to access via car or on foot.